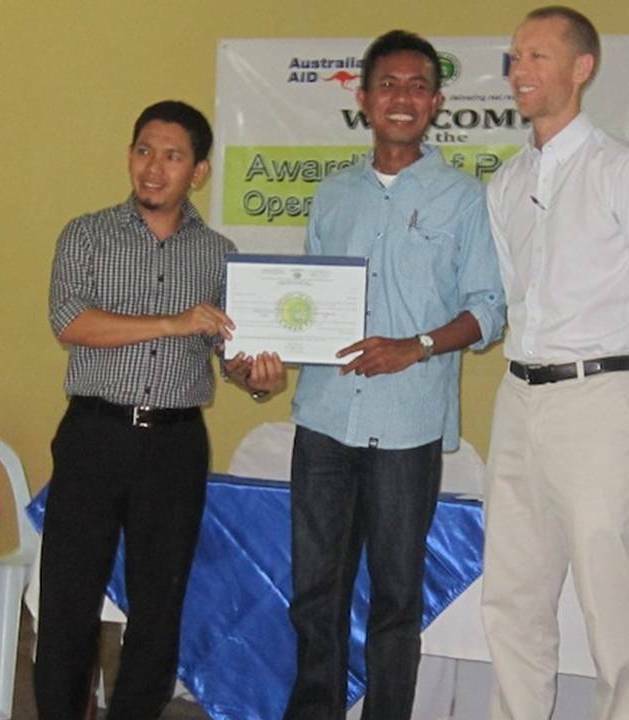 at an awarding ceremony held at the Estosan Hotel, Cotabato City on June 19, 2013.
and Mr. Kevin Corbin, BEAM-ARMM Program Team Leader. The Bureau of Madaris Education (BME) awarded Permits to Operate (PTO) to the 26 madaris assisted by the BEAM-ARMM Program. The PTO is an acknowledgement from DepED-ARMM that these madaris offers a unified culturally sensitive curriculum and has become part of the Philippine education system. The BEAM-ARMM Program plans to support at least 30 madaris in the BASULTA (Basilan, Sulu, and Tawi-Tawi) areas to improve physical facilities and strengthen teaching capacities. The Basic Education Assistance for Muslim Mindanao (BEAM-ARMM) Program, funded by Australian AID and implemented by DepED-ARMM, is a 6-year education program that enables children and youth in Muslim Mindanao to develop and reach their potential. The Program delivers accessible and healthy learning facilities, quality teachers, learning materials, and a protective environment for children in need and out of school youth, through effective, transparent and accountable management systems. The Program contributes to the alleviation of poverty in ARMM and, in the longer term, to the emergence of sustainable peace through closely targeted investments in basic education that prepare ARMM to engage productively with economic opportunities as they arise. The contribution from the Government of Australia for the initial 3-year phase of BEAM-ARMM is valued at AUD $85M and AUD 8.5M over 72 months from the Government of the Philippines.